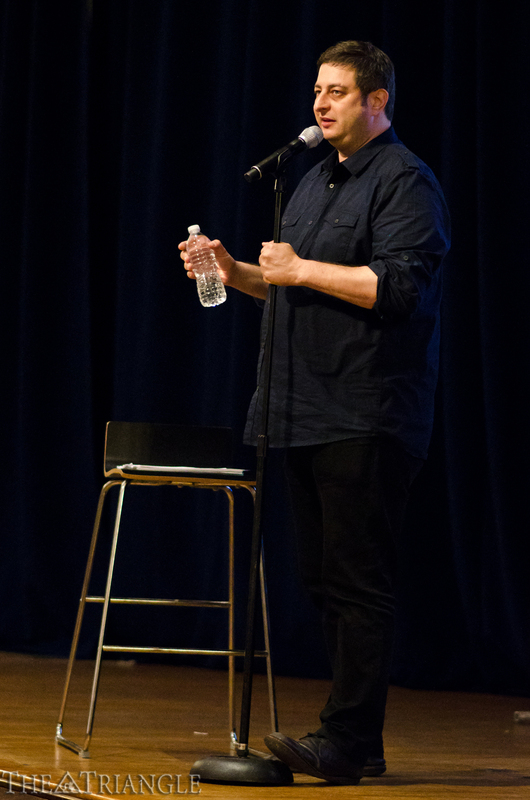 In the Campus Activities Board’s 14th annual Comedy Show, the well-known comedian Eugene Mirman — the voice of Gene on Bob’s Burgers, the landlord on Flight of the Concords, and a regular guest on Comedy Central specials — performed Oct. 25 in the Main Auditorium. Mirman opened with a bit where he explained that he liked to yell strange things in the grocery store to his girlfriend just to see the reaction of his fellow shoppers. “You know what, I am going to get toilet paper; I don’t think it’s a waste,” he shouted. Mirman also joked about messaging celebrities on Facebook, asking a pastor obscene questions online and creating fake Christian Mingle accounts. The latter got a great number of laughs from the audience when Mirman explained that the site had terminated his account. In another particularly humorous bit, Mirman retold his encounter with a 12-year-old boy with Asperger’s syndrome. He was on tour, reading his new book aloud to fans, when the child pointed at him and asked rather loudly why Mirman didn’t accept him as his god. “[Religion] all becomes clear when you realize that God is a 12-year-old boy,” Mirman said jocularly, hinting that all of the world’s plagues, wars and puzzles could be explained so easily if only there truly was a prepubescent boy, in the sky, behind it all. The audience seemed to enjoy the show thoroughly, which Mirman concluded by pretending to marry two audience members, making them agree to humorous vows. 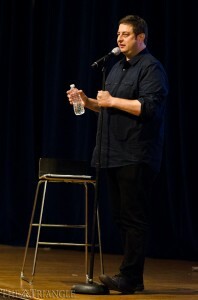 Mirman’s opening acts, Drexel student and Student Comedy Competition winner Ari Fishbein as well as comedian Kurt Braunohler, warmed the crowd up earlier that night with stand-up routines of their own. Fishbein began the show with none other than a classic Holocaust joke. He then casually transitioned into a bit on heart disease, kidding that he was going to give in to his predisposition for the illness. Professional comedian Braunohler then took the stage, greeting Drexel University personally. He transitioned, then, into telling jokes that amused the audience about online reviewers, a trip to London where he accidentally put his clothes in a trash compactor, and most notably, his first bar fight. The comedian had evidently been drinking when he offended the disc jockey in the establishment, DJ Jazzy Nice. When the two tried to duel it out, the comedian’s first bar fight took an unexpected spin. First, Braunohler experienced a cascade of self-inflicted injuries, including cutting his arm and spraining his wrist. After this, the pair somehow ended up wrestling into a phone booth and butting heads — technically faces. “It’s my first bar fight, I’m bleeding from the arm, and I just kissed a dude!” Braunohler said, as the audience chuckled at his tale, shortly before he welcomed Mirman.